As member of the WHO endorsed SRL network and WHO Collaborating Centre for Tuberculosis Laboratory Strengthening, the Emerging Bacterial Pathogens Unit (EBPU) of Fondazione Centro San Raffaele (FCSR) has active technical assistance projects in Nigeria, Burkina Faso, Cote d’Ivoire, Mozambique, Djibouti, Turkey and Kosovo. Amongst our activities, the EBPU is supporting National Reference Laboratories in the GLI Stepwise Process Toward TB Laboratory Accreditation, and is establishing panel-based External Quality Assessment (EQA) for microscopy, proficiency testing for culture, identification, and DST. ​This five-day course focuses on developing knowledge and skills needed for a successful implementation and optimal utilization of new TB diagnostic tools. 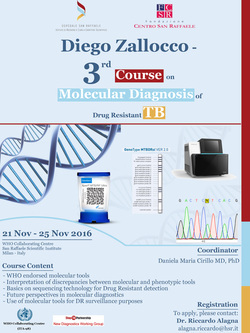 Participants will explore various aspects, from theory to practice, of all techniques currently endorsed by WHO for the rapid diagnosis of tuberculosis and detection of antibiotic resistance as well as advanced molecular innovations (Whole Genome Sequencing). The international environment will foster experience sharing among participants and experienced course facilitators.